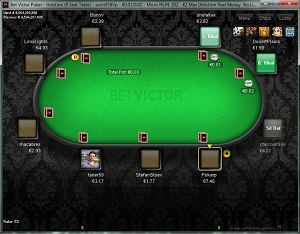 BetVictor is on the MicroGaming Poker Network, now known as MPN. They do not accept players from the U.S.A. The lowest deposit limit for BetVictor is $5.00 by Skrill. They have most popular payment methods available, with reasonably low limits. BetVictor is the new name for VictorChandler Poker. They are one of the oldest bookmaker chains in England and a household name. They are licenced in Gibraltar and are backed by a publicly traded company. It is safe to say that they are a rock-solid online poker room, and are safe and secure. They accept all major payment methods including Visa, MasterCard, Neteller, Skrill (MoneyBookers), PaySafeCard, Ukash, Paypal, Bank Transfer and Western Union. Player to Player transfers are not allowed. They also accept most major currencies, though your poker account will be in Euros. Deposits start at $5.00 and £5.00 if you are using the Skrill ewallet. There is a $10.00 and £10.00 min. if you want to use your credit card, or any of the other popular payment methods such as Neteller, Paypal or UKash. They also accept Laser cards, and Maestro and Solo cards, and Visa Electron plus many others. All those named start at $10.00. You can use PaySafeCard to deposit here too, starting at $15.00. The lowest stakes available to poker players here start at blinds of €0.02 / €0.04. BetVictor has a lot of promotions for new players, and they also offer a poker school, and a points league. One area where this site really stands out though is in ongoing promotions for existing players, with a lot of prize money available to regular players on the site. The MPN poker software used by BetVictor is pretty good, with most of the features that players have come to expect from a poker room. Player numbers are reasonable good, better in the evenings and weekends as is common. Peak times are European. Lower stakes players and beginners are strongly represented on this network, and accordingly the play can be a bit wild and loose. The presence of such loose players can make the whole poker experience great fun for those players that like a lot of action. Of course, it can be annoying and frustrating for those players that play at a very serious level. The variance alone can upset many mid-level players, who cannot handle getting rivered too frequently. From the perspective of a looser type of player though, tight tables tend to take a lot of the fun out of the game, and it can be very disappointing to hold pocket aces, bet into the pot, only to see the whole table fold to you. For more action-focused players then, this site is ideal. BetVictor also operate an online sportsbook, or bookmaker, and of course an online casino. There are some great deals to be had on those platforms too, but you will get notified by email about all the promotions available to you once you sign up with the poker room. There are some good value propositions available across their betting platforms, with a ‘matched bet’ offer available on the sportsbook of £25, which can be great value, and you can turn it into a “no lose” bet if you know what you are doing in relation to sports betting. All in all we have no hesitation in recommending this poker site. Aside from the current free offer (which leaves you with no excuse not to try them) we have been dealing with these guys for years and have never had any problems or issues. The only negative I can think of is the limits available to winning players in the sportsbook, which can be very low sometimes. That is not specific to these people though; that is an industry wide issue, and is all too common among the larger online bookmakers. That of course will not be an issue for their poker players, but it is the only negative I could think of.